Summary: The Ab Flyer is a revolutionary exercise device that is taking abdominal training in a whole new direction. 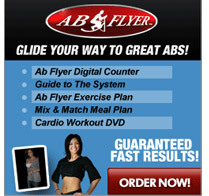 The Ab Flyer is a revolutionary exercise device that is taking abdominal training in a whole new direction. Unlike traditional crunches, which work your abs from the top down, the Ab Flyer works your abs from the bottom up, while limiting stress to your neck , back and shoulders. The Hanging Leg Raise is a bottom up exercise that is highly effective for developing great abs. But it is a very difficult exercise to perform. Here’s why. The exercise requires not only tremendous upper body strength to hang from a bar, but it also requires you to perform a lower abdominal contraction while lifting the entire weight of your lower body. This exercise sounds hard because it is hard. In fact, for the average person, this exercise is nearly impossible.But not anymore. The Ab Flyer makes this difficult exercise possible for anyone to perform. Its weight-bearing design elim-inates the need to hang from a bar and places the user in a comfort-able kneeling position off the floor. The Ab Flyer guides you through a perfect lower abdominal lift while eliminating strain to your neck, back and shoulders. The Ab Flyer engages your abs from start-to-finish, giving you a continuous core contraction with every repetition. The free motion seat adjusts to target your obliques at every angle for a complete abdominal workout.